First time in the shadow! 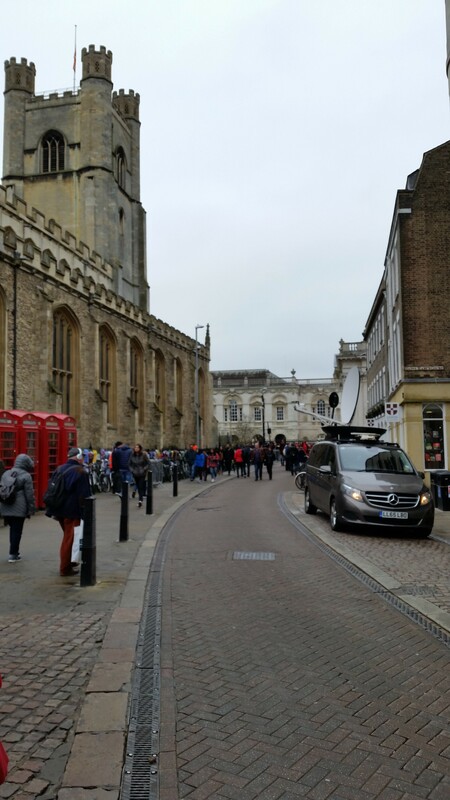 When I came to United Kingdom I set in Cambridge, the city where Stephen Hawking used to live for over 50 years. During the 3 years stay in this university city I hoped, that maybe I will be fortunate to see this wonderfoul person. 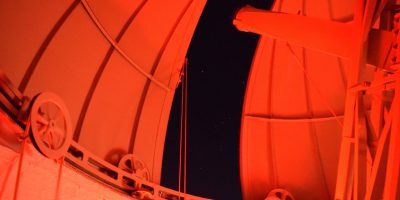 This hope became real, when I joined to Cambridge Astronomy Association, when I though, that possibly Stephen Hawking will appear there with some lectures. This did not take place. I could see him during my short work in Addenbrooke’s hospital in Deep Clean team. 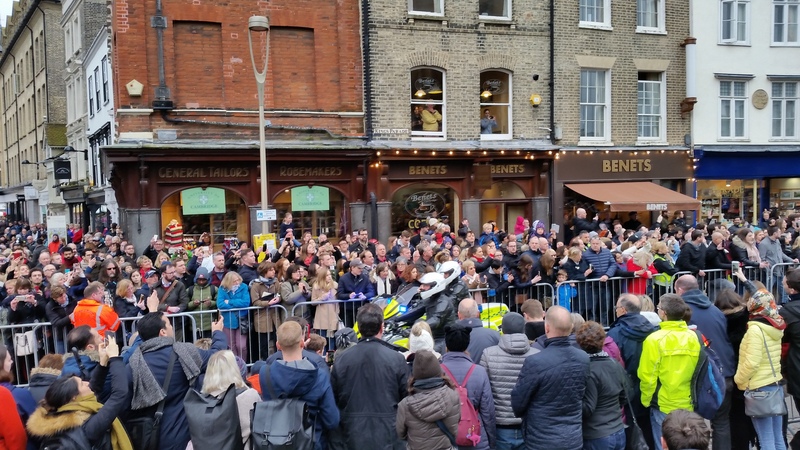 On the last day of my work – 13th November 2015 Stephen Hawking was carried to the hospital. As long as I remember it was somewhere on the 3rd floor. One of my colleagues Cosma Cardoso saw him just after the nurses put Stephen on the bed and right after this put shutters down in the window. No one was able to see the biggest scientist in the hospital, even through the window. 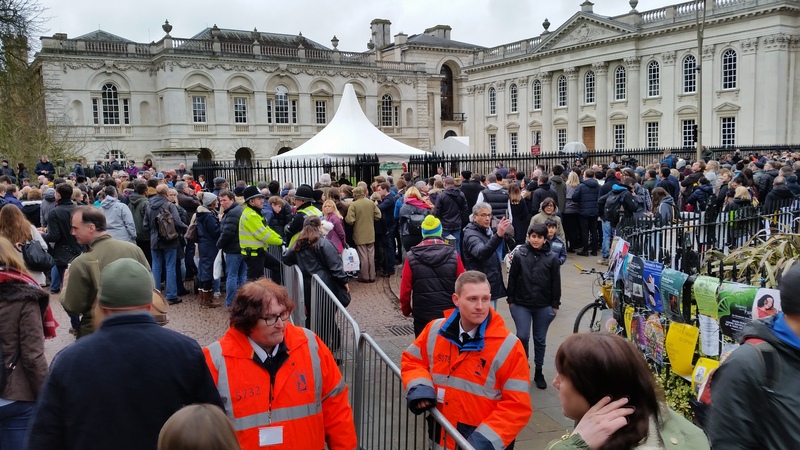 Even the working stuff had a restrictions except the healthcare personnel. 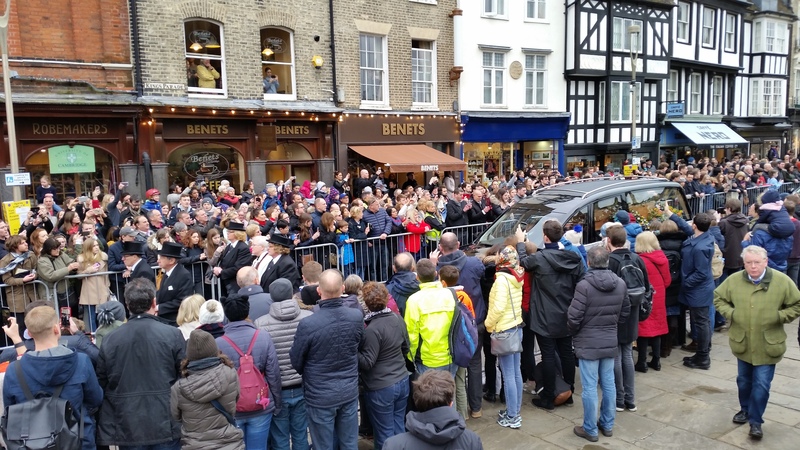 Unfortunately I had no ocassion to see Stephen Hawking personally, but I am very lucky, that I live in the city, that Hawking was associated with. On 14th March 2018 I have read very sad information about the Hawking’s dead. The 14th March is known as an internationl day of number Pi (Pi day). The March 14, 2018 was exactly the 139th Albert Einstein’s birthday. More than often the Steven Hawking was compared to Albert Einstain. Both of them were the biggest scientist in the world. Their life was quite different however when we take into account the mathematical circumstances both life lasted exactly 27823 days! Albert Einstein was born on 14th March 1879 and died after 27823 days on 18th May 1955. Stephen Hawking was born on 8th January and died after 27824 days in 14th March 2018. 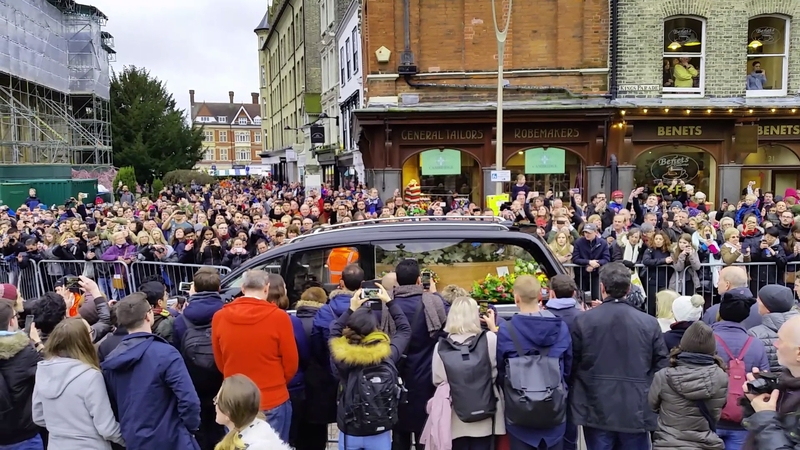 However he passed away in the early hours of wednesday morning, so his life was probably a little bit shorter than 27824 days. Both Albert Einstein and Stephen Hawking were 3974 weeks and 5 days old at the moment of death. The period between Albert Einstein birth and Stephen Hawking death is exactly 139 years, that makes 50769 days and consequently 7252 weeks and 5 days. 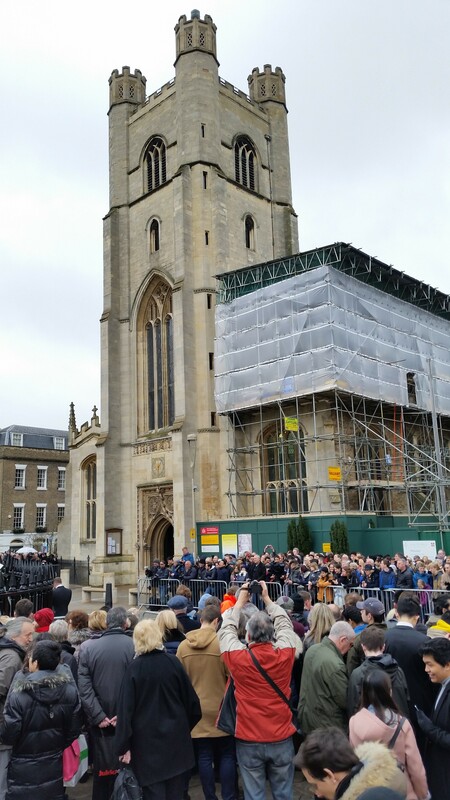 The Easter Saturday 31.03.2018 was the day of Stephen Hawking funeral in Great St. Mary’s Church in Cambridge. 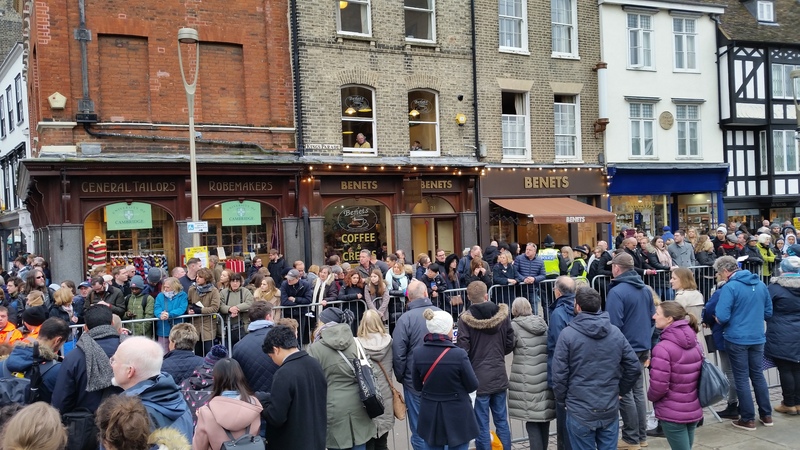 The celebration began at 2pm. 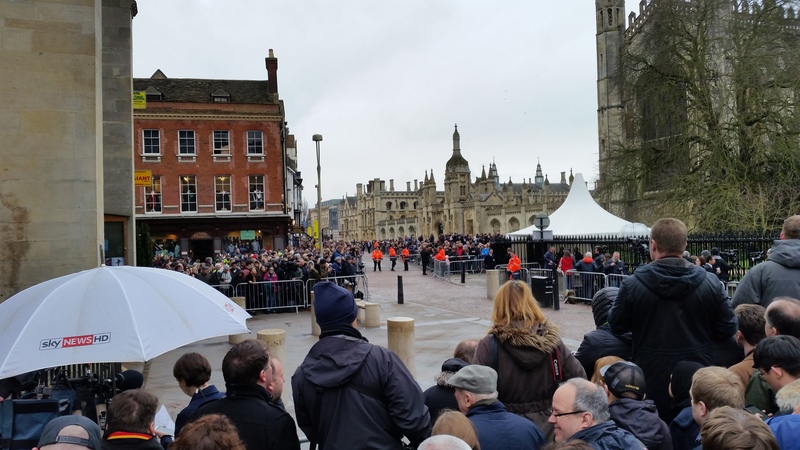 A few thousands people have gathered around this church more than half an hour before the ceremony. 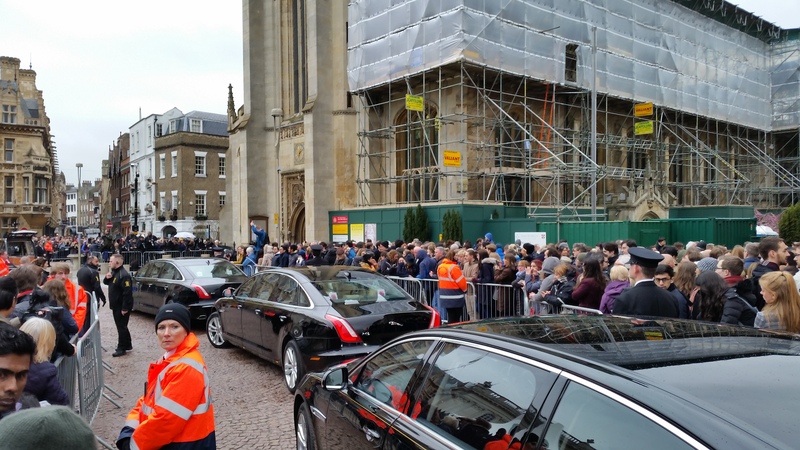 There were a lot of renowned guests on the funeral like Brian May, Anita Dobson, Elon Musk and Alan Bennett. 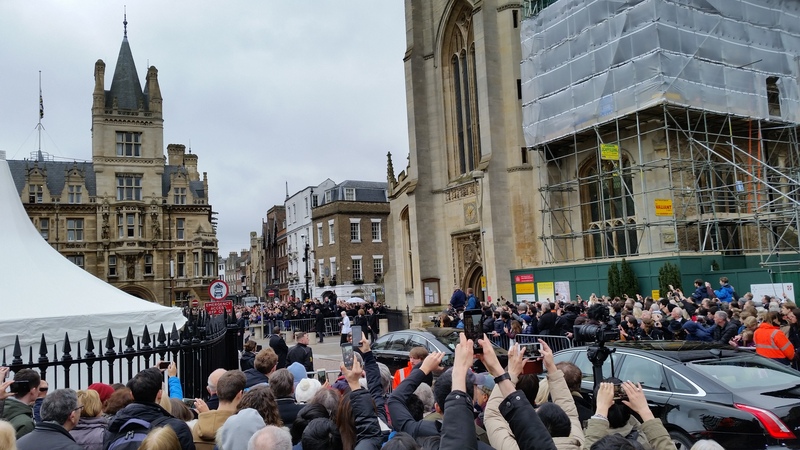 I decided to take part in this ceremony too, alongside with another few thousands of people, who encircled the Great St. Mary’s Church and adjacent streets. 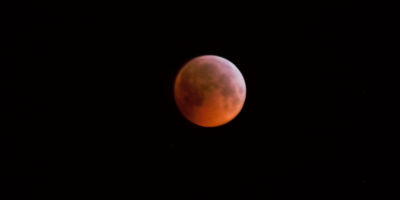 I have prepared a short photo relation below. However I realise, that you will find a photos taken from better perspectives in the web. I came near the Great St Mary’s Church around 1:20pm and unfortunately the best places were taken. After maybe 10 minutes I found quite nice place for myself. 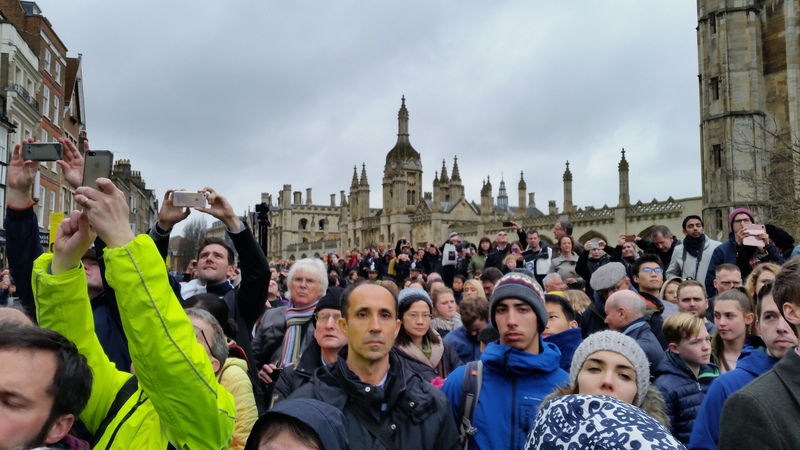 I standed up on the wall next to King’s Parade between a lot of people peaced together. I could see the church entrance clearly from there. Pic. 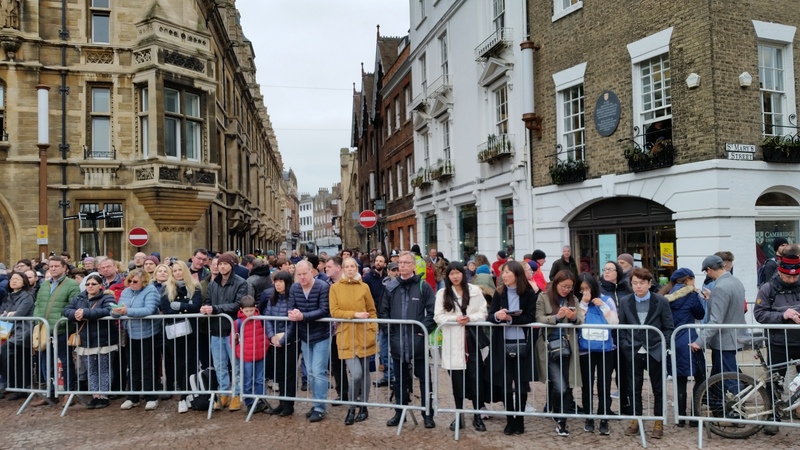 1 People going on the Stephen Hawking’s funeral ceremony, St. Mary’s Street, 31.03 1.15pm. Pic. 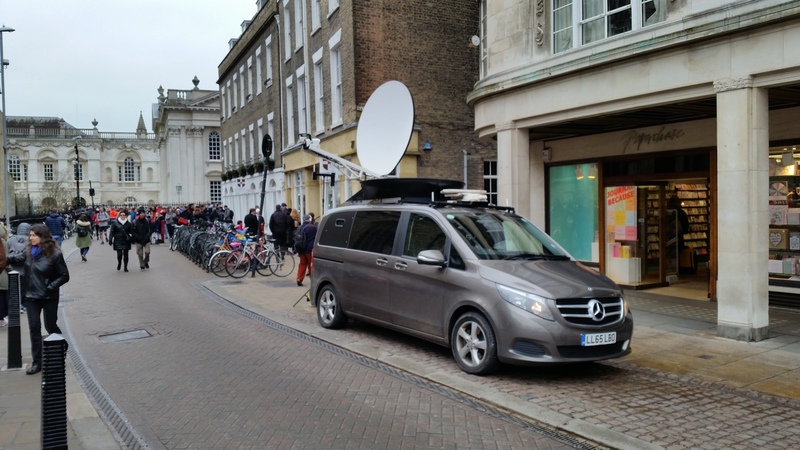 2 TV operators standing across the St. Mary’s Street. Pic. 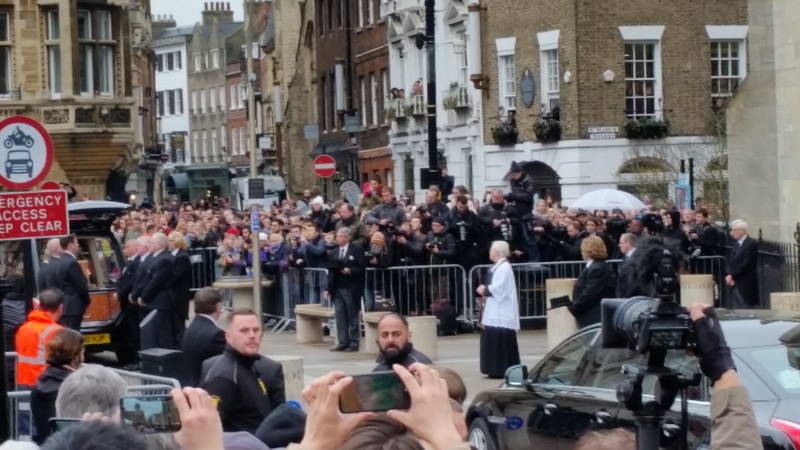 3 Awaiting for the funeral ceremony a front of Great St. Mary’s Church. Pic. 4 Crowded St. Jone’s Street. Pic. 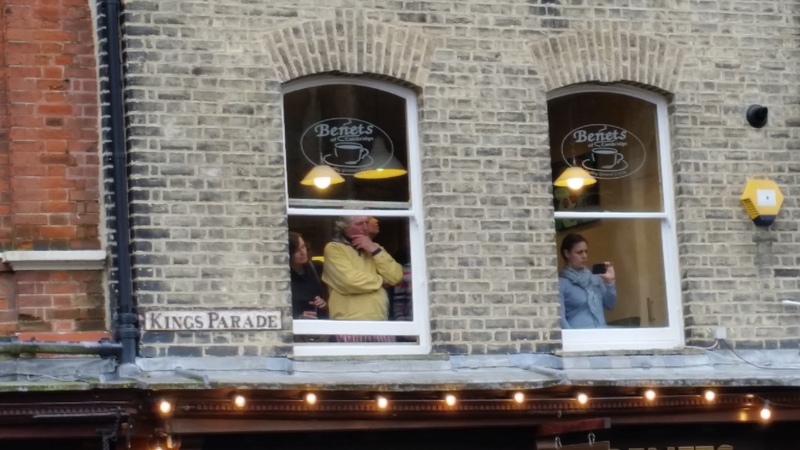 5 Crowd on the King’s Parade. Pic. 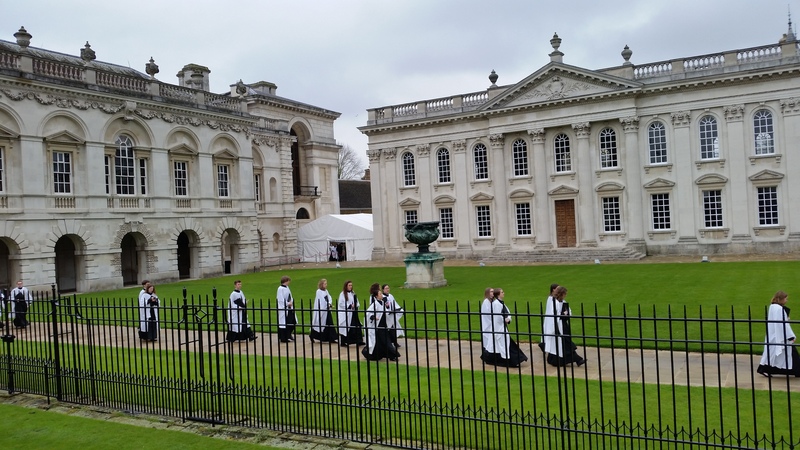 6 View towards the Gonville and Caius College – the Stephen Hawkin’s academic home. Pic. 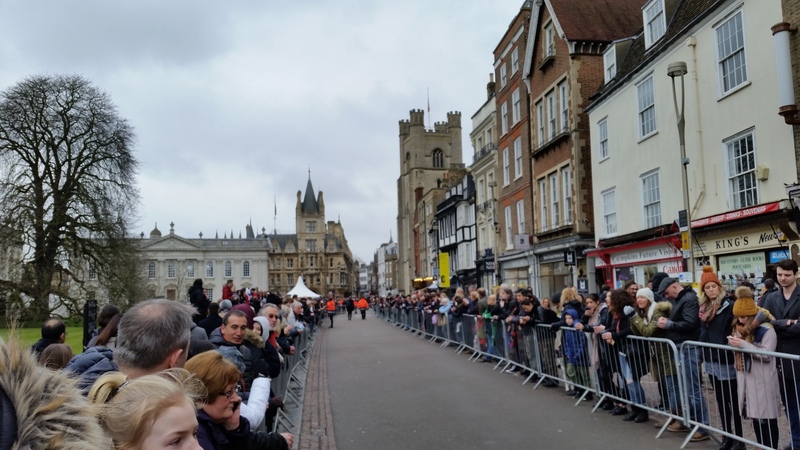 8 Great St. Mary’s Church surrounded by crowd of people awaiting on the ceremony. Pic. 9 People gathering on the St. Mary’s Passage. Pic. 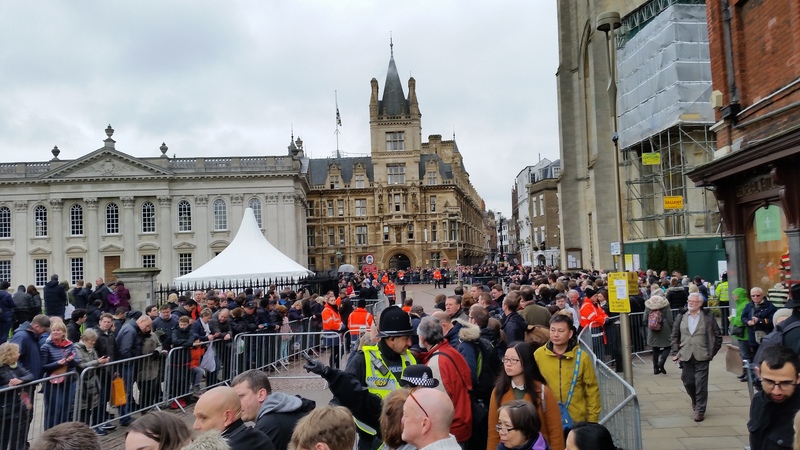 10, 11 People awaiting on the funeral, King’s Parade. Pic. 12-14 The funeral is due to beginning. Pic. 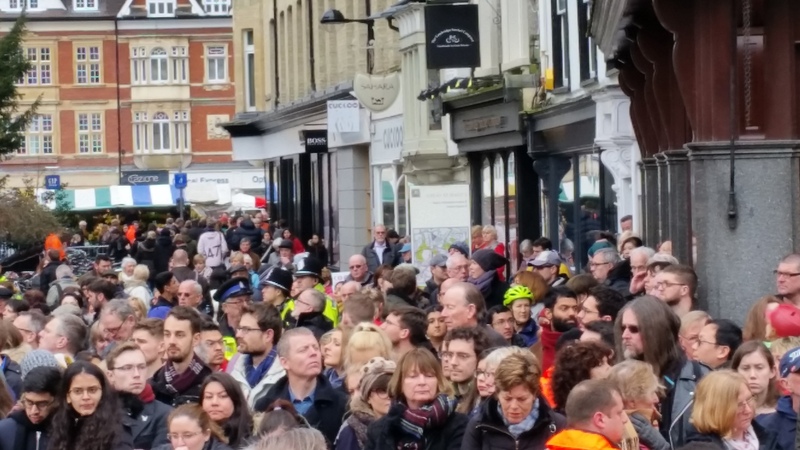 15 Crowded St Mary’s Passage. Pic. 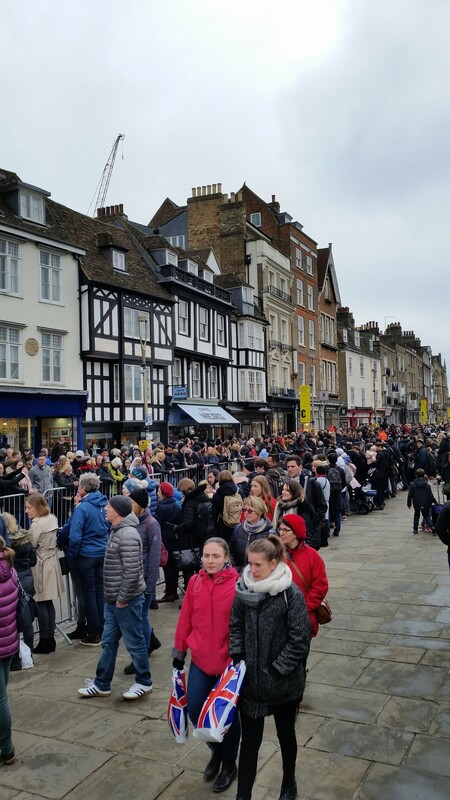 16 The funeral is due to start, King’s Parade, 31.03.2018, 1:55pm. Pic. 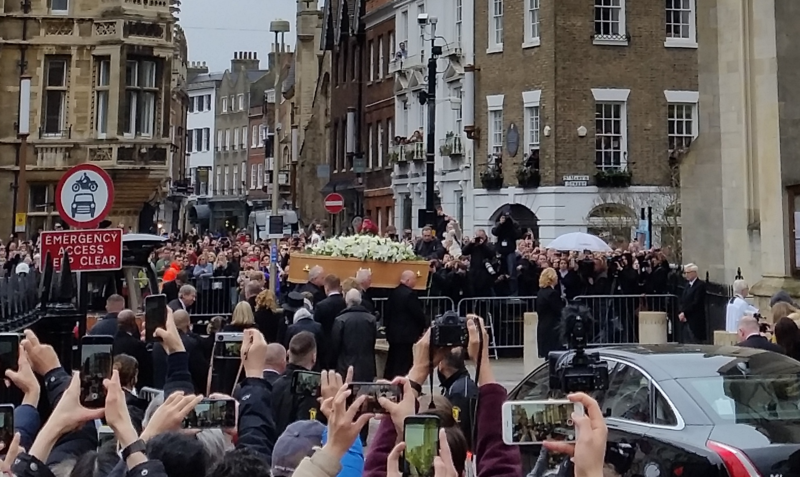 17 – 19 The professor Stephen Hawking’s coffin is carried into the Great St. Mary’s Church, King’s Parade. Pic. 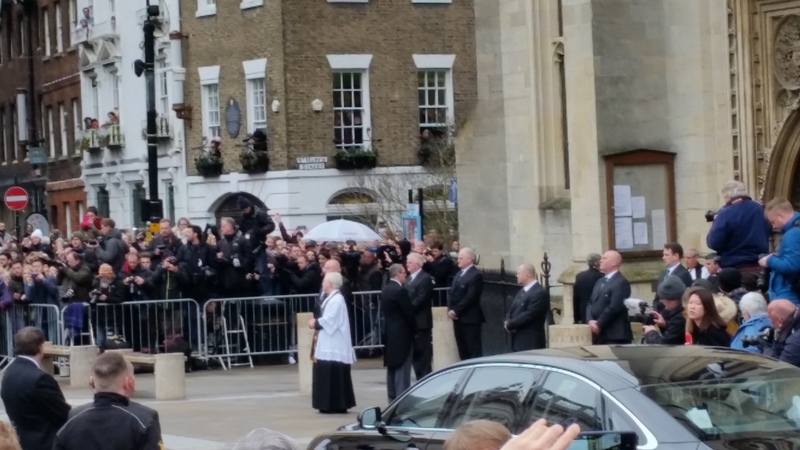 20 – 23 The professor Stephen Hawking’s coffin is carried into the Great St. Mary’s Church. Pic. 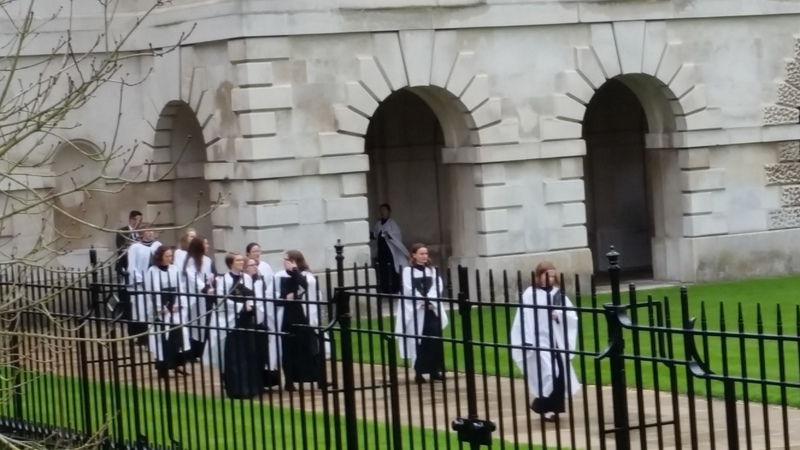 24 People occupying the King’s Parade footpath and watching the Stephen Hawking’s funeral ceremony, view towards the King’s College Porters Lodge. Pic. 25. 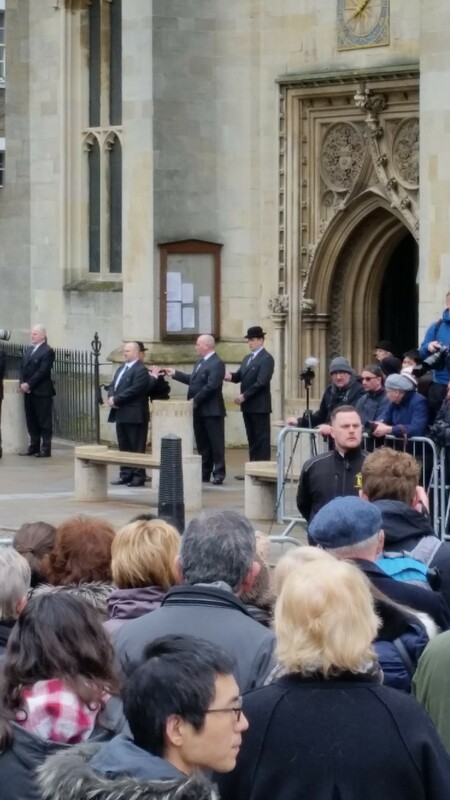 Important guests coming on the Stephen Hawking’s funeral ceremony. Just after when coffin has been carried into the church people started to spread and leave this place. Some of them decided to wait until the finish of the funeral. I was not in this group of people. 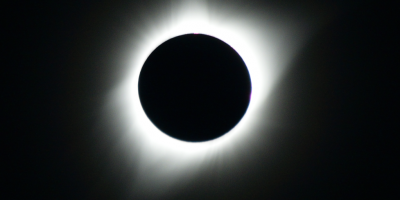 Weather was unfavourable because of rain and low temperature. Pic. 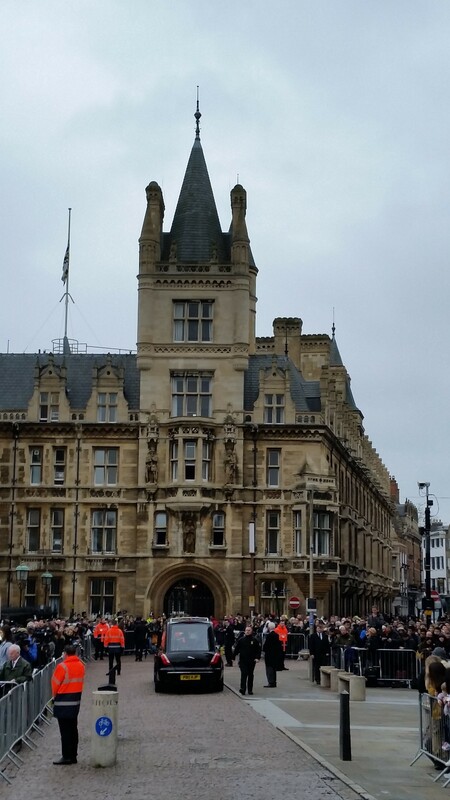 26 The Gonville and Caius College with the funeral vehicle. Pic. 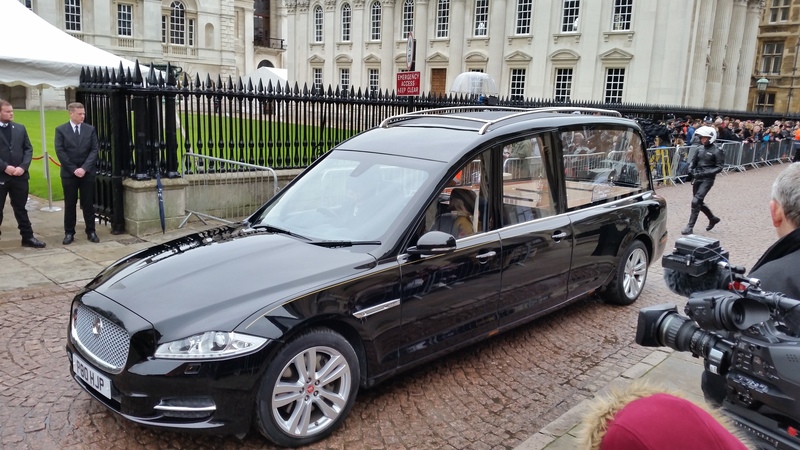 27 Professor Stephen Hawking’s funeral vehicle. Pic. 28. 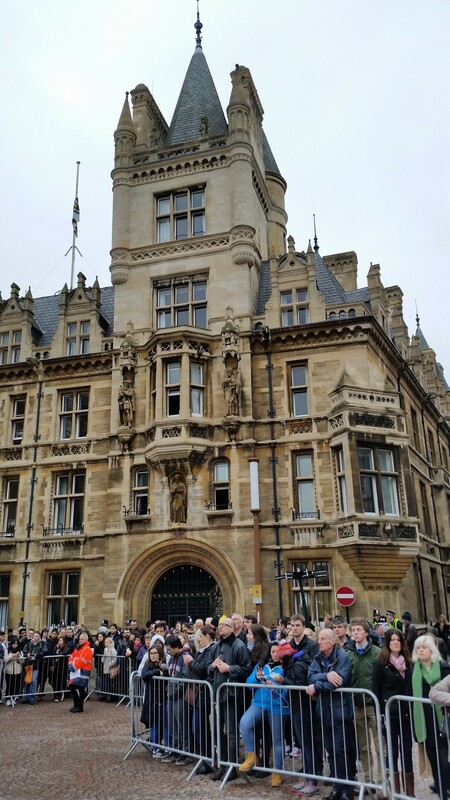 People gathered a front fo the Gonville and Caius college, where professor Stephen Hawking’s spent a very long time in his career. 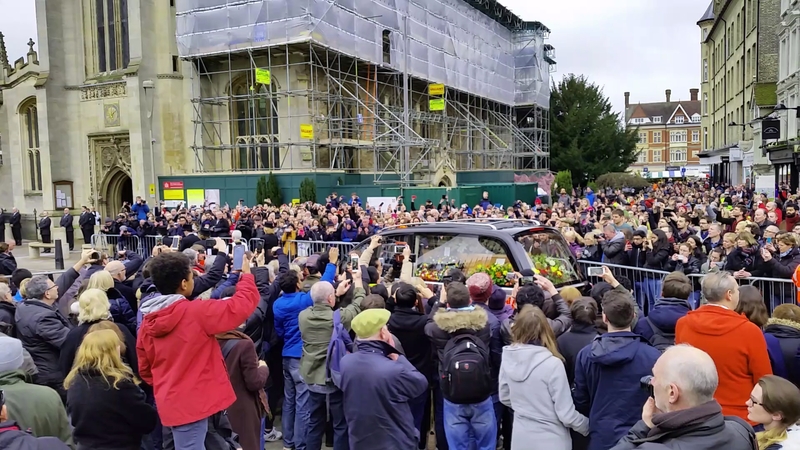 The funeral ceremony lasted around one and half hour. Whole church was guarted safely likewise main roads, where people used to gather. I saw at least 20 police officers and other dozen or so safety guards. 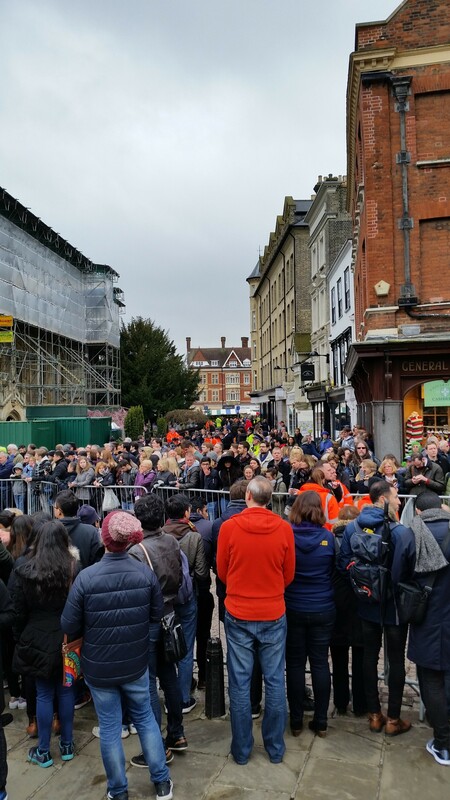 The area under prevention was sspreading down the Market Hill, at lest Trinity Lane and Trumpington Street. Pic. 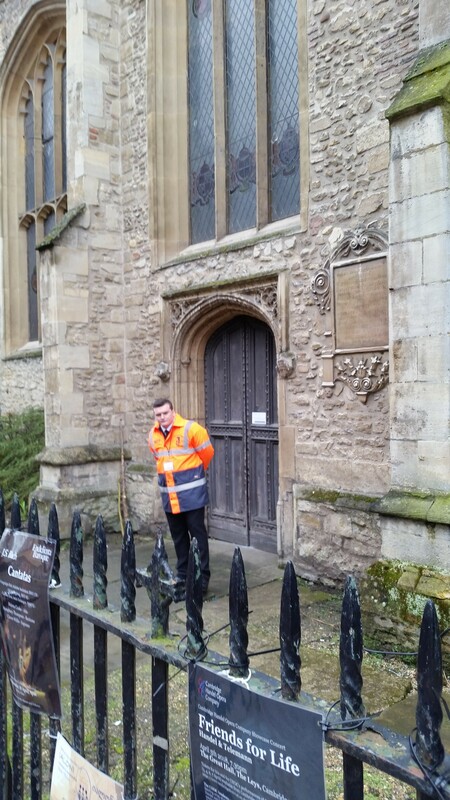 29 One of the security officer guarding the side door of the Great St. Mary’s Church from the St Mary’s Street side. 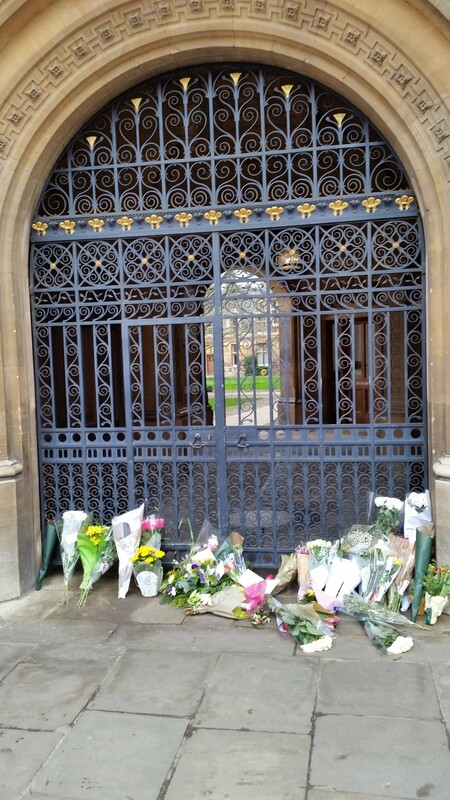 Under the main doors of the Gonville and Caius college – the place strongly associated with the professor Stephen Hawking people left condolences. Pic. 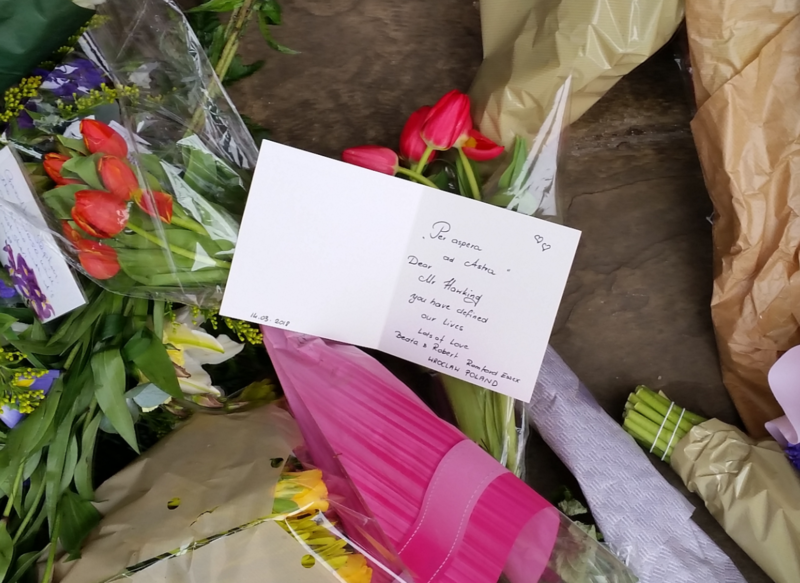 30 The flowers with condolences under the Gonville and Caius College main entrance. Pic. 31 …and also Polish accent. How to calculate the duration of your life?